Dog collar is the thing none of dog handlers will do without. 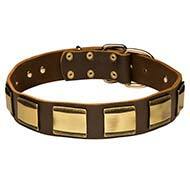 Our hospitable pet boutique is glad to introduce best dog collars – highly sought and fashionable. How to choose appropriate dog collar just for your lovely canine? In fact, it is easy to do. Certain photographs and specified parameters will help you to make a right choice. Comfort of your dog during walk depends upon regular choice of dog accessory. All dog collars available in our online dog shop are certified and absolutely safe for dog health. Any dog should have collar but it is difficult to choose this essential accessory as might appear at first sight. There is special dog ammunition not only for each dog breed group but also for certain events and various kinds of dog training. 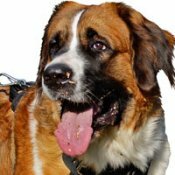 Unfortunately, dog handlers more often than not have many difficulties in choosing a right dog collar out of a great variety of those offered by modern zoo-industry. Our experienced staff will render you invaluable assistance in picking dog collar appropriate just for your beloved pet. 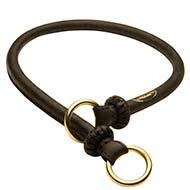 We will help you to make a wise choice of dog collar and equip your pet with right accessory. Soft classic dog collar (walking, with handle for protection & guard service, guard). These dog collars are made out of leather, nylon or combination of the two materials. Usually, these dog collars have interior soft padding (felt, fleece, thin leather with gentle filler) in order to provide maximal comfort for a dog. Walking dog collars are most popular types of canine collars. As a rule, these have a one D-Ring for leash attachment. It can be secured near buckle that will not prevent the motion of the dog's head in that case. Or it is fixed on the other side of dog collar and then dog owner will not need to seek for the ring in order to leash his dog (when such collar is on a dog, buckle as heaviest part weights down according to gravitation law). 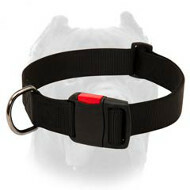 Dog collars for protection training have a convenient handle for holding a dog. D-ring for leash is built in the handle or right under it. Generally, it is another D-Ring near buckle and during leash training it is better to attach a leash just to this very ring. Guard dog collar is most dependable time-proved type of canine collar. 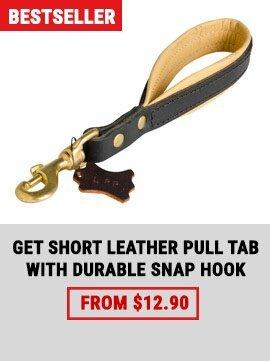 It is meant for constant dog's being on the leash therefore it must be extremely durable. 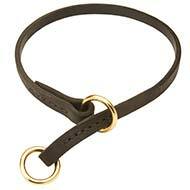 The major distinction of such a collar is that the collar strap is first run through the D-Ring and only then buckled. Thus, pulling efforts of the dog fall not on the buckle and the holes for inserting the buckle's tip but on dense material to be run through the ring. The buckle is also at the top and therefore does not disturb the dog. 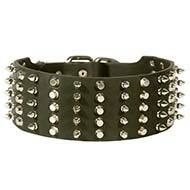 Choke dog collar (metal chain, leather, synthetic). These dog collars are often used as both training and exhibition facilities. However, their low weight is great advantage and for that reason these are well suitable for regular usage. Their choking effect is accepted by dogs as something too approximate to their natural conditions of education within the pack: mother teaches her child slightly pinning him by the throat. Nevertheless, any similar action on dog especially on little puppy must be precise and short-lived otherwise any educative value will be ineffective. 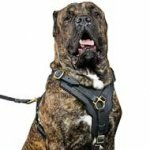 Before allowing a beginner using this dog collar an experienced dog trainer must circumstantially not only explain but also display how to properly act on a dog. Metal or choke chains are to be made of durable alloy; all its links must be welded or sealed off but the coating is to be applied so as not to traumatize the dog. Nowadays many dogs suffer from allergic reactions to nickliferous alloys. Consequently, a specialized cooper-loaded alloy was worked – curogan which color is a little bit darker and redder but the alloy does not cause allergy in dogs. It is worth keeping in mind that some not very qualitative chains may color hair of light-colored dogs. Hereat, before visiting dog show it is better to try a chain. One more note: short-woolled dogs or the dogs having long bushy hair are exhibited with thin almost jewelry chains around their necks. These chains are used in order that dog neck should not visually seem divided and for prevention of hair's getting flattened. But the bigger chain's link the less such chain cuts dog hair. Accordingly, owners of German Shepherds use chains with long links (up to 5 cm). Pinch collar (strict one). 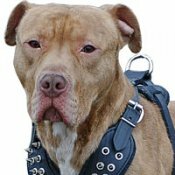 This type of dog collar is to be considered special and it must be used only under guidance of experienced dog trainers. Main characteristic of such collar is presence of spikes that do discomfort the dog when tension is applied to the collar. 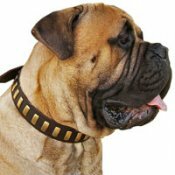 Pinch collar is to be chosen obligatory taking into account neck circumference of a dog; it must be placed right behind the ears and in no case hang loose or fall. One of the most famous producers of high quality metal dog collarsis German maker Sprenger (HS Collars) . Their assortment of dog production includes several types of pinch collar – wire and tabulate, with long spikes for long-haired dogs and short ones for smooth-coated dogs, from different materials and having different coatings. The last development of this company is the pinch collar which spikes are arranged on both sides from center base in the area of dog Adam's apple. Dog experts think that such arrangement of spikes causes more natural pressure on dog neck thus imitating bite or mother pin. Anyway, it is forbidden to wear a dog in pinch collar all the time – this collar is to be used only during training or when other educative techniques in respect of obedience training were tried but turned out to be useless. Complete devotion to usage of pinch collars inexperienced dog handlers practise to wear their dogs in since early puppyhood when their pets are still 5 months old involves negative consequences and adversely affects general obedience and possibility of dog control. Exhibition collar is not to be ornate in order not to distract attention from the dog himself (as a rule this collar should go together with color of dog coat therefore it is picked in conformity with color of dog hair). It is important, that exhibition collar should not visually divide the dog's neck but at the same time it must be comfortable, reliable and practical. In most cases these are synthetic ringovkas made out of think cord or choke chains. But, there are several dog breeds including German Shepherds and Dobermans whose exhibition performance requires long-term run within the space of the show ring. At that the animal should run in front of his handler and hold his head highly elevated. In such cases dog specialists use metal or leather ringovkas with laryngeal prominence. The Adam's apple can be metal or leather, with spikes (if dog is a hard puller) or without, with special pan in order to lift the dog's head higher. 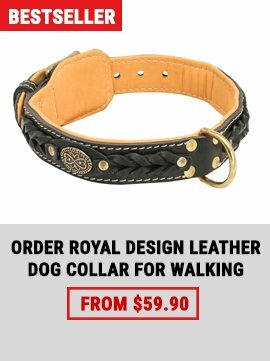 It is possible to fit any dog breed with dog collar. However, you should consider peculiarities of anatomical organization of respiratory passages of some dogs. 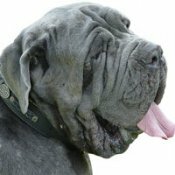 For example, pug-dogs and the other dog breeds with short snout are very sensitive about action on neck zonae and may even suffocate therefore it is recommended to have them harnessed but not collared when walking or training. There are collars broad in front part of the neck that are used for graceful dogs (e.g. greyhounds). But in any case dog collar must be maximally reliable and non-destructible because of regular wear. Dog collars are made out of durable leather, synthetic hitch or cord, metal and also from their combinations. Leather is most pleasant material for both person and animal. Quality dense leather will always be fashion and beautiful but at that will serve for many years. But as any leather product such collar is in need of careful treatment and special care. Nylon can be considered strongest material to be used for manufacture of soft dog collars. Resistance to environmental loads, various weather conditions make them indispensable in daily life. All the more so dog owner has the right to choose color, width and modification of dog collar according to his preferences and taste. Soft dog collar made of leather and synthetic bond is most longevous and dependable. If such collar is made in line with prescribed standards and its finish hardware is reliable then such combination will be sure-fire way for guard dog collar or protection training of large and active dogs. It is clear to understand that quality metal dog collars may serve for many years thus being worn by not only one dog but throughout generation of dogs. Yet it is not recommended to use this collar in cold season as it is the risk of getting frost-bitten for the dog. You are quite able to sew down dog collar for your pet independently. But you should not forget that safety not only surrounding people but also your pet's often depends upon its dependability. Therefore you should take into account your dog's size and power and choose materials and finish hardware so as their breaking strength should exceed your dog's weight 5 times minimum. Soft dog collar should be chosen in accordance with the following: make sure that when the collar clasps in the middle hole (i.e. usually there are more two and two holes to less and bigger sides) it does not muddle about the dog's neck. Commonly it is possible to pass the owner's thumb under the strap: if the finger does not pass then this collar will press the neck down but if, on the contrary, it is much room under the collar it may slip off the dog or turn around the neck. If you choose dog collar for a little puppy then bear in mind that the dog will be growing. It means that collar size must be appropriate. First of all, this collar must be regulable so to say it is to be adjustable according to the dog's growth. 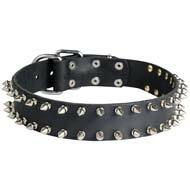 Secondly, dog collar for a puppy must have loose part of strap not very long in order not to discomfort the dog wearing it. I.e. at this moment the collar is to be clasp in the last inner hole but as the dog grows his owner will be able to buckle this collar in order to fit it to the current size of his dog's neck. You should not make your dog wear collar all the time as dog collars are known to fray dog hair and put the animal to inconveniences and discomfort. 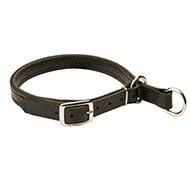 If it is necessary to keep your dog at home then for this objective it is better to apply a leather choke collar. Do not forget, that dog collars are not just accessories but simple clothes of dogs. You know, dog wears this accessory almost for 24 hours. Thus, dog collar is to be qualitative, comfortable and safe. 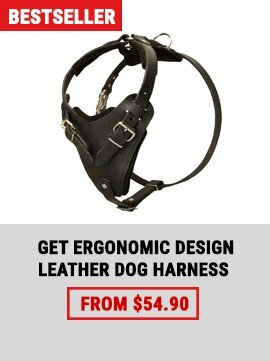 Only in our online reputed dog shop you can buy such equipment for your four-footed pal.